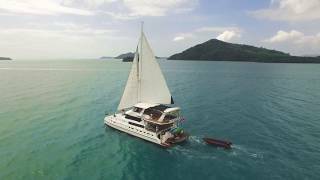 SHANGANI is a very versatile 70 ft catamaran which is able to carry up to 60 passengers. This boat is mainly used for large groups. SHANGANI can sleep 14 adults and two children in 6 air conditioned and comfortable cabins. Shangani... from a Saloon to the Jacuzzi. Y- Welcome drinks and snacks on arrival. Y- You may bring your own alcohol, no extra corkage charged. Y- National park fees and crew gratuity are not included in the price. Fly-board, Jet-Ski's, Sea-bob, Fishing Gear, Scuba Diving Set, Snorkelling Equipment. Please place your order from the Sanyati menu before departure with Yachtside.